It also brought back so many memories of how it felt to get that diploma. It was such a sense of completion and accomplishment. I am not sure if I was more excited at my high school graduation or my college one because both were just major moments in my life. Okay, so you may be wondering, what does graduation have to do with a Christian blog? Well, it was a thought that came to my mind when I couldn’t sleep one night about how awesome our future “graduation” will be, and how much we prepare, study, and live to obtain it. Following God and trying to walk in the footsteps of our Messiah is kind of like going to school to me. It requires studying. It requires hard work, and no I am not saying we earn our salvation. However, try to live by faith without works, and I will “show you my faith by my works” (James 2:18). “Faith without works is dead” (James 2:26b). In other words, one must live their faith by doing, which requires hard work. It is hard “work” to be slow to speak, slow to anger, and instead quick to listen in today’s world (James 1:19). It is not easy to “esteem others better than” ourselves (Philippians 2:3). It is not easy to live life without complaining and arguing (Philippians 2:14). And it is definitely not easy to “love your enemies, do good to those who hate you, bless those who curse you, pray for those who mistreat you” (Luke 6:27-28). Our Christian walk requires hard work and studying God’s Word so that we have the strength to run and not grow weary (Isaiah 40:31). Why do we work so hard to live by faith? Because we want the end goal just like a student works hard to graduate. 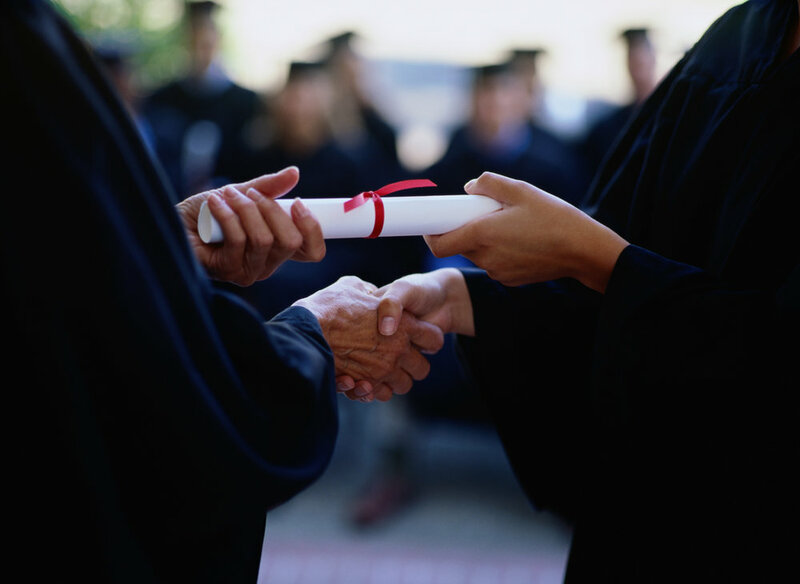 We want that “diploma” that says “Well done good and faithful servant” (Matthew 25:23). We want to spend eternity in God’s Kingdom, which will make all the sufferings in this life and all the labors of this life “not worth comparing with the glory” and joy we will have in God’s Kingdom (Romans 8:18). So, when life seems to become cumbersome, when all you want to do is throw in the towel and “drop-out,” put your “eye on the prize” and look forward to your future “graduation” that will make all the graduations of this life small in comparison.